“ABC Union Monsters”: Support mới mạnh mẽ của dòng Union Monster! Once per turn, you can either: Target 1 LIGHT Machine-Type monster you control; equip this card to that target, OR: Unequip this card and Special Summon it. The equipped monster is unaffected by your opponent's Trap effects. (If the equipped monster would be destroyed by battle or card effect, destroy this card instead.) If this card is sent from the field to the Graveyard: You can Special Summon 1 Union monster from your hand. “ABC” Combining Form – Fusion Monster! 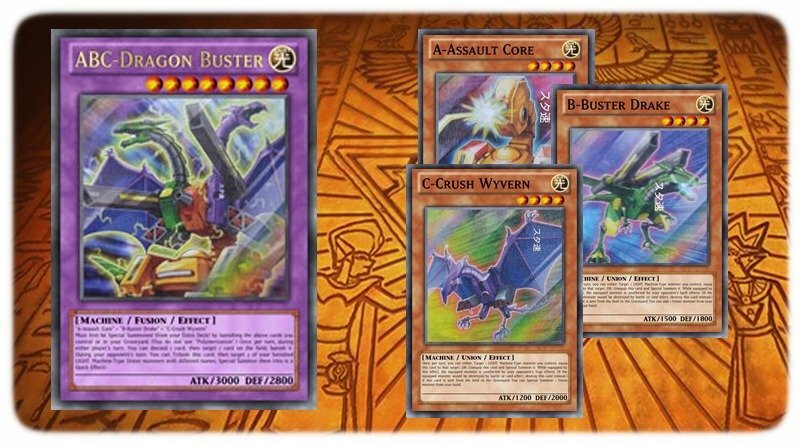 Materials: "A-Assault Core" + "B-Buster Drake" + "C-Crush Wyvern". Must first be Special Summoned (from your Extra Deck) by banishing the above cards you control or in your Graveyard. (You do not use "Polymerization".) Once per turn, during either player's turn: You can discard 1 card, then target 1 card on the field; banish it. During your opponent's turn: You can Tribute this card, then target 3 of your banished LIGHT Machine-Type Union monsters with different names; Special Summon them (this is a Quick Effect). Ngoài ra, trong Structure Deck: Seto Kaiba còn có các support chung cho dòng Union Monster khá tốt, thích hợp với ABC Deck. When this card is activated: You can add 1 LIGHT Machine-Type Union monster from your Deck to your hand. Once per turn, if a LIGHT Machine-Type Union monster(s) is Normal or Special Summoned to your field (except during the Damage Step): You can target 1 of those monsters; equip from your Deck to that monster 1 appropriate LIGHT Machine-Type Union monster with a different name from that monster, but that Union monster cannot be Special Summoned this turn. You can only activate 1 "Union Hangar" per turn. Decklist tham khảo: ABC Infinity! Những card sử dụng tốt trong deck ABC Infinity! Cặp đôi "Gold Gadget" và "Silver Gadget"
⇒ Bộ đôi Gadget có khả năng kéo ngay 1 Machine monster và ở đây là những quái thú thuộc ABC!! ⇒ Engine chính để giúp deck tung ra chủ bài Cyber Infinity! ⇒ Tech card giúp biến những ABC monster thành Galaxy Soldier, Cyber Dragon đồng thời kích hoạt effect “sent to Graveyard” của chúng!